Below is a list of the most FAQ (frequently asked questions) for the Summer 6 Football League. If this does not answer your questions please contact us and we will answer your inquiry. How do I know which age group I’m eligible to play in? Can I play in more than one division or age group? Players can play in more than one age group or division if eligible. However, you must pay reduced $$$ additional player registration fee to do so. 10 round plus finals in each centre .Winners will qualify for the Summer 6 Champions League. How do I qualify for the Summer 6 Champions League? The 8 winners from each centre qualify for the Summer 6 Champions league finals to be played on the 17th December 2016. What happens if a game is Forfeited? Forfeited games result in 3 points being credited to the non-forfeiting team. If a team forfeits 3 times they may be expelled from the competition without refund. Is there any chance of expulsion? Summer 6 Football League reserves the right to expel or suspend players, teams or spectators involved in any sort of on or off field violence, including verbal abuse of officials- No refunds will be paid to teams expelled or who withdraw from the competition. What happens in bad weather ? Rain is not a problem . All our 8 centres are state of the art all weather turf pitches & surface will recover immediately .we need to be vigilant about lighting most lightening storms pass over quickly which may cause a delay . Our organisers will contact team managers and posts will be updated via our Face book and instagram pages. Games will not be called off just because it is raining all our facilities have grandstands ,clubhouses and RSL Clubs attached for the comfort of all our spectators . Hugh Bamford (North Bondi) & Rodney Reserve (Dover Heights) are grass fields should there be cancellation of matches due to council park closure summer 6 football league if possible will endeavour to make up matches on a alternative day. How many Players can I have in my team? Each squad is to comprise at least 8 players and a maximum of 12. Teams to field 6 players (including a goalkeeper) for each game. Games will NOT be delayed for teams short of players. Teams will be permitted to commence play as long as 4 players are on the field at the start of play. You can bring on any late arriving players after kick off. How many Substitutes can I use? You can make unlimited substitutions. Subs must be made at the half way line and player coming on must wait until the substituted player is off the field. Moulded or turf boots are recommended studded boots will NOT be allowed to enter the playing surface under no circumstances . North Ryde, Concord , Bankstown & Kyeemagh locations Indoor runners & sandshoes can be worn turf boots are however recommended , Bondi Junction ,North Bondi , Sutherland & Dover heights moulded or turf boots can be worn. Are shin pads required to play? Must be worn; this is not negotiable. Players will be asked to leave the field if they are found not to be wearing shin pads. All teams jerseys must be uniformed and numbered . 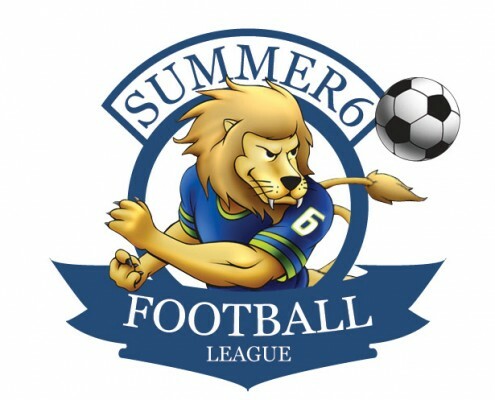 Teams that do not have numbered jerseys will not be able to compete in Summer 6 Football League this is to ensure players are registered and identified with a playing number . Teams can wear team uniforms or can purchase our awesome summer 6 football league jerseys at only $39 per player. Will balls be provided ? Yes summer 6 football league will provide all the match balls for the competition . Will the goals and nets be provided? All Goals and Nets will be set up and taken down by ‘SUMMER 6 FOOTBALL LEAGUE’ staff. YOU JUST HAVE TO TURN UP AND PLAY AND HAVE FUN !!!! What is the Duration and kick off rules for Seniors? Each game will start at the scheduled time so BE ON TIME. A siren will go off to indicate the start and finish of each half. Each game is 40 minutes in duration with 20 minutes played in each half. What is the Duration and kick off rules for Juniors? Each game will start at the scheduled time so BE ON TIME. A siren or whistle will go off to indicate the start and finish of each half. Each game is 30 minutes in duration with 15 minutes played in each half. Who can enter the playing Field? Spectators, coaches or substitutes are not allowed to enter the field of play. A substitute or coach can attend to an injured player. Will there be warm up areas? Teams must warm up on the field of play prior to kick off in their game. What happens if there is bad language or violence? We do not tolerate bad language or Violence in our competition. Teams, players or spectators who use excessive bad language or violence will be thrown out of the competition. Referees will report teams, players or spectators who use bad language or violence during games. Will there be any registration checks? ‘ SUMMER 6 FOOTBALL LEAGUE’ staff reserves the right to check registration at any time. If you feel another team is playing unregistered players please notify our staff. What happens when unregistered players are used or players used from other teams? Teams playing a disqualified, unregistered player or a player from another team may forfeit the game be fined $100. If it happens twice teams may be banned from the competition. If teams use players from another team and found guilty risk losing any points received for that game. You can register players till early September , so don’t risk it. Teams can only borrow players from other teams once they declare a forfeit so a friendly can be played. Please note players can register for more than 2 teams but must pay additional registration fees at reduced cost please see our S6FL staff for further information. How many ladies must be register to play in Summer 6 Mixed Competition? Minimum 3 ladies must register and must have min 2 ladies on the field at all times . Is there any Grandstand seating and canteen services available at the grounds? Yes all the playing areas are of high quality are fenced with grandstand, seating, clubhouse and or RSL Clubs are attached to the centres making it a friendly environment for all our players and spectators .